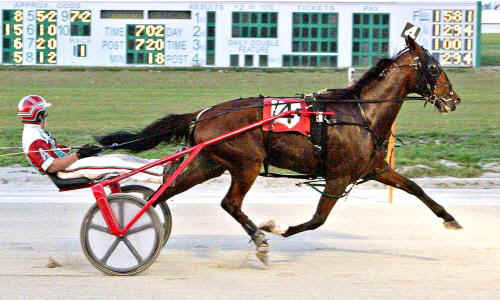 Lebanon Raceway is a harness racing track located in Lebanon, Ohio, at the Warren County Fairgrounds. The track conducts live racing on Thursday, Friday and Saturday nights, and holds meets beginning in autumn and running through the winter, as well as in the spring. The track offers simulcasting from harness, Thoroughbred and quarter horse tracks throughout North America seven days a week. The facility is also home to the Warren County Fair, usually conducted the third week in July each year. On 5 December 2009, a fire destroyed a barn at the racetrack, killing 43 horses and two people. Authorities say both of the people killed were men, identified as harness racing trainers at the track. It is unclear what caused the fire, but only the efforts of firefighters prevented the blaze from spreading to other buildings on the site. According to the Ohio State Fire Marshal, there was no sign of criminal intent, but the cause was undetermined. Age and design of the barn is also considered a factor in the rapid spread of the fire.